Step 3 to a beautiful weed-free yard is to use ferti-lome Green Maker to fertilize for your first of 3 applications during the season. It is specifically designed for alkaline soils like we have in North Texas and offers slow-release benefits to feed for up to 90 days. 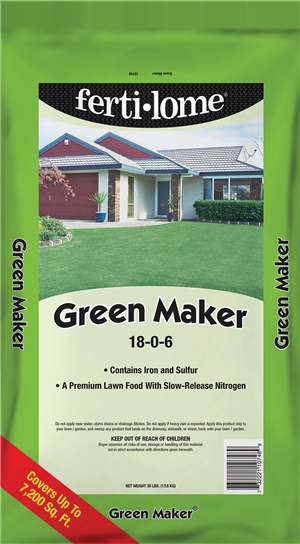 This will help eliminate unhealthy surge growth and the added iron offers quick green-up. Apply with a broadcast spreader, generally just under half open, but check the instructions. One bag will cover 7,200 square feet. If you get some on your concrete areas you’ll want to sweep it off so it doesn’t stain. After you’ve spread it, water it in. Lush, healthy grass will help keep weeds at bay!